Upon arrival at the Guilin airport, pickup by our English speaking tour guide and drive to hotel. Leisure on your own at the rest of the day. A vist to the small church at night is quite an experience. You might also join in the crowd for Christmas shopping on Zhengyang Road. Every evening, thousands of locals and travelers will rush into the Guilin Zhengyang Buxing (pedestrian) Street for shopping, entertainment and dining. The dazzling lights from various shops, the bubbling people, the multifarious goods justify this stree's reputation as "Shopping Heaven in Guilin". It is very crowded in this small church on Sunday and big events. Ceromonies including perfamance of believers are held here, through holidays of Christmas, Easter, etc. Many celebrations and activities is taking place in dozens of home church around the town. 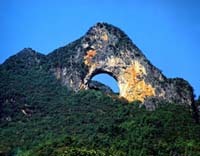 Situated on the west bank of the Li River, the Elephant Trunk Hill is shaped like a huge elephant with its trunk going into the water, so it is named as so. 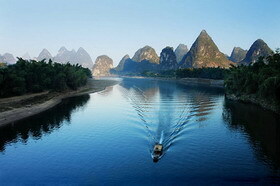 It’s worthwhile climbing up it to have a great panoramic view of Guilin and the natural scenery from the top. The total Journey is around 30 Kilometers and takes 4 hours. Free time in Yangshuo. It is an ancient street with a history of over 1,400 years and lies in the heart of Yangshuo. It now draws visitors for its unique mix of cultures. The 2000-m-long street enjoys various bars, cafes, restaurants,art crafts and souvenir stores, foreign language clubs and even Kungfu schools. Morning cycle along trails to see rice paddies, farm house, green limestone hills and countryside, bike ride is very popular in Yangshuo. 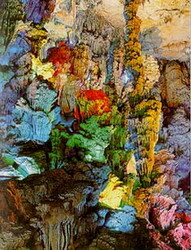 Visit Moon Hill on the way. If you do not like bike tour, we will drive you to this area. 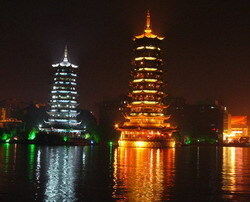 Later today you will be transferred to Guilin airport for your flight home.